LONDON is beautiful, organised, polite, precise, well, partly cold but as one gets into the coach for Bradford there is a distinct smell of India in the air. The driver, conductor, most of the passengers are all brown skinned speaking in chaste Malwa Punjabi interspersed with British English. Soon all identities are forgotten as lush green plains open their arms to the clear blue sky above. The heady combination of lemon and green merge the soul into the marvellous rolling, unfolding expanse below and a great peace descends. There is no dirt, garbage, poverty to distress, only one continuous peace. Six hours later, one is in Bradford. Check in at travel lodges ( £25/night with bed and breakfast) or if in a lavish mood then check in at Hilton where the charges start from £100 onwards for a single room per night. Spend the day at the golf course. Enjoy the Indian cuisines at Agra restaurant , Indian restaurant and the like. There are many and reasonable too. However, keep the evening reserved for the moors. Hire a car and visit the wildest, most beautiful moor of England, Ilkalemoor. The wind roars, sighs, shakes, even screams as one gazes down to the peaceful Leeds below. There are so many shades to the green, one did not know. Everything is in harmony and temporary nirvana is attained as the senses and the soul blend. However, the moor is incomplete without its ancient ghostly past. Relax in the "Cow And Calf" one of the oldest inns of England. The inn started as a boarding house in 1896 came to b called as a "Highfield Hotel" in 1909 and acquired it’s present name in 1949. The ambience is of late nineteenth century with antique furniture, rich d`E9cor but if it is the ghosts one is waiting for, then the inn is famous for its view of strange sightings and processions on the moor at night. 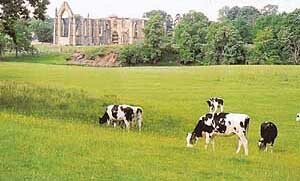 However, nothing bowls one over so completely as Bolton Abbey. Bolton Abbey is 80 miles of footpath, moorland, woodland and spectacular riverside scenery, barely one hour of drive from Bradford. 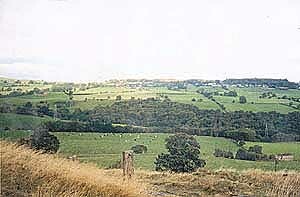 The estate belongs to the 11th Duke and Duchess of Devonshire and is with the family since 1750 The undulating landscape, the New Jeresy cows , the river Wharfe with its preening ducks, the timeless ruins of the Priory , the canopy of trees , the gentle breeze make one surrender to the panaroma . 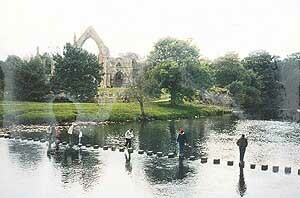 The river Wharfe narrows down to a stream and one can cross it either through the bridge or if one is in a more adventurous mood, by hopping on to the wooden kegs planted in the middle of the river . The water is not very deep here and one can relax and feed the friendly ducks . The priory overlooking the river also houses the family graves, a gentle reminder of the mortality of man. If one is lucky, one might see a beautiful, white-clad, blushing bride with her newly-wed husband posing for photographs after the completion of the ceremony. However, if one is not up to walking through this whole of the estate then hop on to the Embassy & Bolton Abbey Steam Railway and chugh around. There is a beautiful tea- and-cakes shop if one is peckish. A small village shop offers souvenirs and books giving the history of the place . There is no dearth of hotels here if one wants to savour more of nature. Offering bed and breakfast are also farms which are adjacent to the estate. The real country air comes alive if one wakes up with the baaing of the sheep and running of long- maned stout horses. Bradford is very close to Yorkshire, the old capital of England. Barely two hours drive from Bradford, the place is definitely colder and very English. 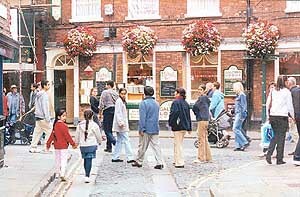 No black or brown population here and the city has the old English, historical air about it. The roads are of crushed stone, narrower, the shops small . The overhanging baskets of Petunias add colour to otherwise grey-stoned city. However, the genius of English architecture comes to the fore as one views the latest coffee shops housed in these old buildings and blending beautifully in it. Life -size Vikings displayed in the windows add history to the place. That with all our heart and mind and our soul and strength we may seek thy face. Once outside, head for the old Railway museum. If it is preservation one is looking at then one can’t help admiring the British for it. Black, green, deep red engines, gleaming and polished dating from the day they first made their appearance impress. One can hop on to them to get a feel of antiquity. However, truly beautiful are the royal coaches. Queen Victoria and her royal paraphernalia, exquisite lace, lavish upholstery of the sofas, special coaches for the maids immediately bring home to the commoner what royalty is all about. these coaches are of course locked and can only be glimpsed from outside. Yorkshire is incomplete without its castle ruins which dot the city. 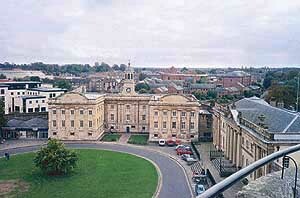 Check in at the numerous inns in the city or if the English cold bothers then rest at Bradford . Take the National or the Punjabi coach and enter again into the metropol London. One muses England is not all about new technology, fast trains, shopping malls but England is all about it’s untouched, well-maintained greens, structures and a deep consciousness of its precious historicity, a sense of subtle patriotism which runs like an invisible thread in the English blood. One understands why the royalty despite being such a drain on the exchequer has survived.